How can teachers push students to learn programming in the classroom through such endeavors as December's upcoming Hour of Code if they don’t know how to code themselves? This question led to the creation of a new app that teaches students the basics of coding without much input from the teacher. Blockly, originally developed by Google, has been updated by Wonder Workshop to allow students to control robots through a simple drag-and-drop interface. Blockly for Dash & Dot Robots enables kids as young as five to instruct the robots to sound an alarm, work through a maze of objects and control one another. There are versions for iOS and Android. 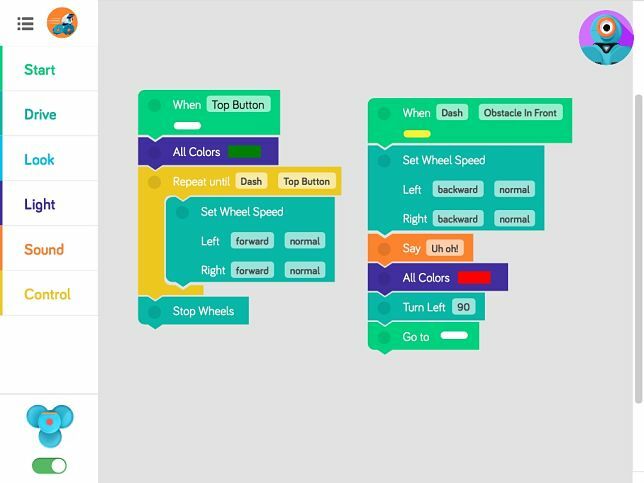 Similar to MIT's Scratch, the open source Blockly uses visual programming blocks that students can put together like pieces of a puzzle to create a program. This fall, the company will begin selling digital curriculum aligned to Common Core and Next Generation Science Standards for second through fifth grades. A handful of teachers who have worked with the robots have also begun uploading lessons to the freely available Wonder Workshop community. "Our goal is to alleviate the pressure and anxiety teachers often experience when it comes to coding instruction," said CEO Vikas Gupta in a prepared statement. "Teachers don't have to do it alone. Coupling Blockly with our vetted curriculum allows educators to address this 21st-century skill without needing to research unfamiliar concepts, develop lessons, assemble products and page through manuals." The company's products have been tried out in numerous schools, including John Muir Elementary (CA), Bloomfield Hills Schools (MI) and Anna H. Rockwell Elementary School (CT).